The basis for soft shingles is fiberglass, bitumen and stone crumb. The popularity of the material provided complete resistance to corrosion and water resistance. It can be used on the roof of any shape, including the dome. Basalt powder protects from heat and ultraviolet, protects the bitumen base from precipitation and mechanical damage. Fiberglass provides the strength of the material, and bitumen full waterproofing. Due to the versatility of the coating, many are interested in how to cover the roof with a soft roof with their own hands. Manufacturers of soft roofs offer several forms of cutting tiles and a variety of colors. It is possible to scrupulously observe the technological sequence of works to tile the roof. The first stage of the arrangement is the preparation of the foundation. 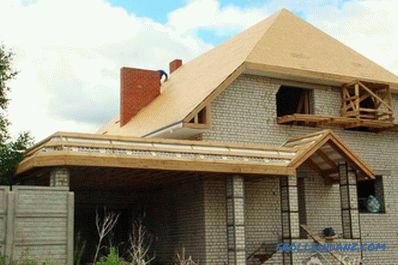 The waterproofing of the roof is influenced not only by the quality of bituminous shingles, but also by batten. The base must be extremely flat, strong and rigid. 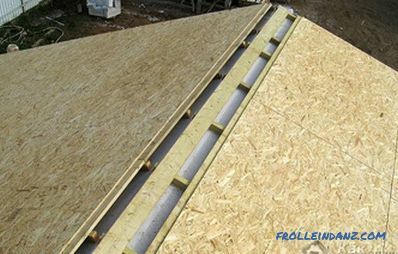 The pitch of the sheathing depends on the angle of the slope and the strength of the winds in the region; it is 50-100 cm. A trim board made of softwood, OSB, and moisture-resistant plywood will be the basis of sufficient strength. To protect against decay, materials are treated with an antiseptic. Between adjacent sheets retain a gap of 3 mm for thermal expansion. The material used must be dried, humidity up to 20% is allowed. Boards are joined over the supports, the length of each overlaps two flights of rafters. Plates stacked in a razbezbezhku and fixed with screws. Galvanized nails are used to avoid metal corrosion. 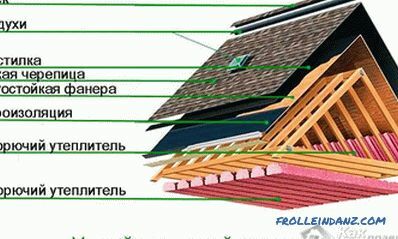 To to ensure air circulation, leave holes in the highest point (on the ridge) and in the place of junction of the eaves. Ventilation allows you to reduce the temperature in the attic, to remove vapors and condensate from under the roof, to avoid ice in winter. The holes for natural ventilation are evenly distributed along the length of the ridge and the eaves. The base should not be adjacent to the waterproofing, so it is important to make a gap of 5 mm. 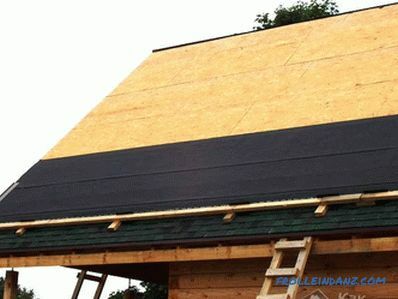 When sloping roof from 12 to 18 degrees roll insulating material spread throughout the roof. Begin work from the bottom, from the eaves, laying the canvas parallel to it. 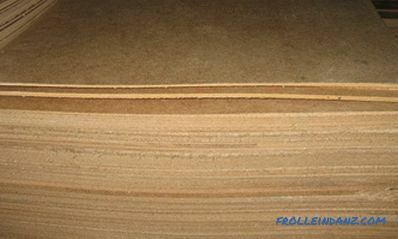 The joints of the lining layer are overlapped, every 20 cm nailed. All seams are sealed with glue. If the angle of inclination is large enough, then separate areas are isolated: dormer windows, skates, valleys, cornices and ends. On the valley, the lining material creeps on both sides, its width is not less than 50 cm. On the cornice overhang, the value of the lining material is 60 cm. The edges of the batten need protection from rain. To do this, along the eaves nail metal drip. It is attached to the gasket layer with an overlap of 2 cm, the nails are clogged every 10 cm. 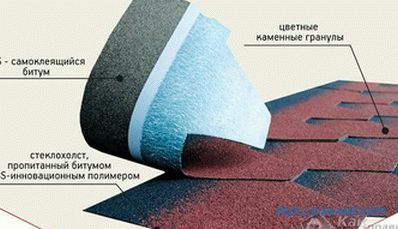 Endova - the area where leakage is possible, in order to eliminate them, the end carpet is laid. It is made of polyester cloth, processed with bitumen and basalt dressing. It is fixed on the roof with mastic and nails, which are hammered 3 cm from the edge. The end carpet is matched to one color with soft tile. The edge of the bitumen shingles is cut so as to leave 15 cm of carpet open. 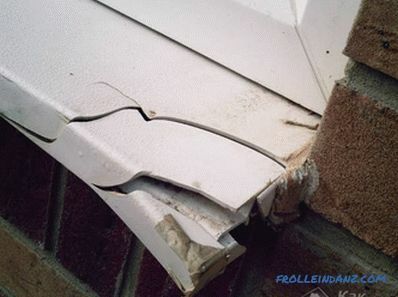 This is necessary to create a gutter through which rainwater will flow. The described method is considered optimal. 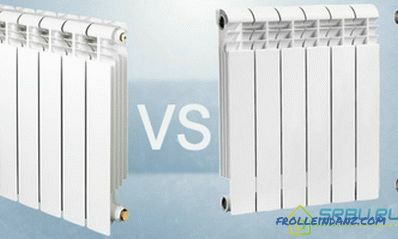 It is recommended to carry out work on laying rows of soft tiles at air temperatures from +5 degrees (° C). At frosts it is impossible to provide normal pasting of bitumen. 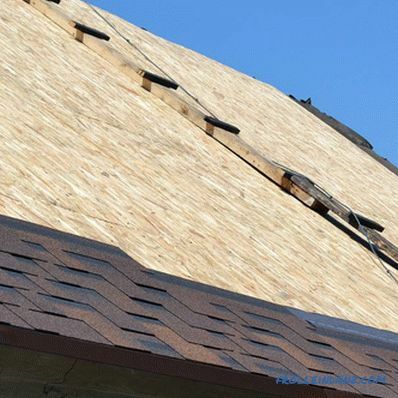 In addition, the material becomes brittle and does not allow to create a curved structure.The combination of tile shingles with the base and between them occurs when heated by solar heat. 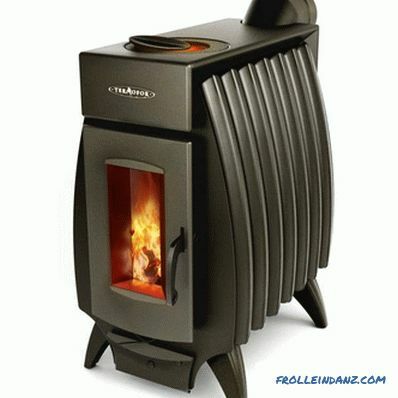 Working at low temperatures, the tiles are brought in small batches, and the bulk is stored in a warm room. 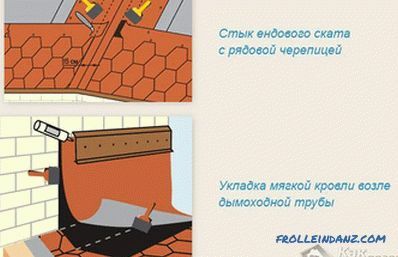 It is impossible to leave a soft roof under the scorching sun so that bitumen does not melt. 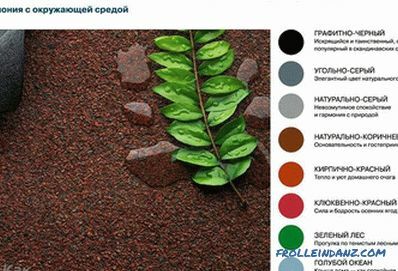 Bituminous tile has small discrepancies in color, it is better to take shingles from different packs, then the transition will be smooth. You should not clean the roof with shovels, you can damage the coating. 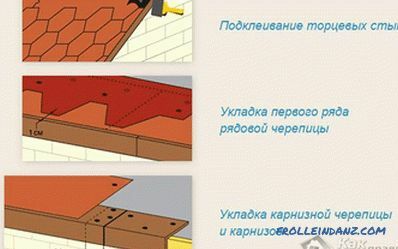 During installation, it is necessary to install the slope angle, which does not allow snow to accumulate on the roof. Before starting to work with shingles, make the basis layout. Horizontal lines are drawn in 70 cm steps (five rows of tiles), the vertical marking is equal to the shingle. This will allow them to be laid in even rows. Cornice row of shingles stack first. It is made of universal self-adhesive soft roof. Before starting, the protective film is removed. Sheets are laid end to end and fastened with nails along perforation. Fixation points overlap next. 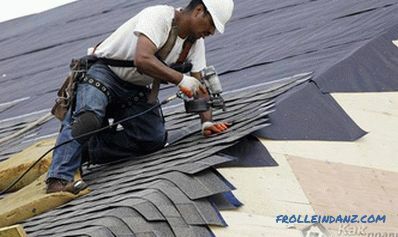 Installation of shingles begins from the middle of the eaves and moves to the ends. The first row should overlap the tiles laid over the cornice, the tile, the distance between their lower edges is 1 cm. When the slope is up to 45 °, 4 nails are used to fix one tile, with a larger value they add 2 nails for reliable fixation. The nail head should be flush with the surface of the shingles, and not bump into it. The petals of the next rows should be at the same level and cover the perforation of the previous one row. Depending on the cutting of the tile, the offset of the next row is selected. This allows you to create a chaotic or ordered pattern. Most models are stacked with a half-petal offset. The markings made before installation will allow the continuation of the rows of flexible roofs interrupted by dormer windows or chimney pipes. At the ends, the soft tile is cut off, not reaching 1 cm before the plank, and its edges are glued with a layer of mastic 10 cm wide and nailed. When cutting the material, plywood should be used as a substrate, this will save from accidental damage to the bottom layer of soft tile. The size of the gutter is marked on the end carpet, it can be from 5 to 15 cm. It should be noted that a 30-centimeter zone is formed around the gutter, which is not nailed. Tiles pruned on the border of the gutter. The upper corner of the shingle is cut off for water recess. Using a trowel, they put mastic on the edge of the tile and attach it to the carpet. To to make a tile suitable for skate, it is necessary to cut an ordinary bituminous tile into three parts. On the edges of the roof ridge tile is laid from the bottom up. After removing the protective film, it is glued and fixed with four nails two centimeters from the edge. The next part is glued with an overlap of 5 cm. The tile on the ridge is laid against the prevailing winds. For ease of installation, each part of the ridge tile is heated in the middle and bent along the edge of the bar to form an angle. The tile is attached to a bitumen base and 4 nails. In the ridge row, soft tiles overlap each other with an overlap, like privates. In order to ensure sealing at the junctions with antennas, chimney or ventilation pipes, they put an end carpet or galvanized metal. When choosing a carpet on the pipe is installed plinth. The pattern of the material used is laid with at least 20 cm at the ordinary tile. The back side of the carpet is coated with bitumen mastic. It is glued along the perimeter of the pipe, the places of contact with the tiles are treated with 10 cm of bitumen mastic. The top of the carpet, which is placed on the pipe, is covered with metal slats. Special pass-through elements are purchased for the device of roofing penetrations. This element fits with the entry of 2 cm on the roof. A hole is cut in the base. The element skirt is glued with mastic and nailed. Its surface is covered with bitumen tile, and the remaining joint is covered with mastic and sprinkled with basalt crumb to protect against ultraviolet radiation. Properly laid soft roof will be a reliable home protection for at least 30 years.